The Trevi Fountain or Fontana di Trevi tops the list of the most celebrated fountains in Rome, if not the world. An iconic symbol of the city, it's a top free attraction (except for the coin you may want to toss in), drawing an estimated 1,200 people to the site every hour. Located in Rome's historic center, the fountain sits on a small square near the intersections of Via della Stamperia, Via di S.
Vincenzo, and Via del Lavatore. The closest Metro stop is Barberini, although if you want to see the Spanish Steps, you could certainly get off at the Spagna Metro stop and walk from Piazza di Spagna to the fountain in about 10 minutes. Given the enormous number of ancient structures in Rome, the Trevi Fountain is relatively modern by comparison. In 1732, Pope Clement XII held a competition to find a suitable architect to craft the new terminal fountain for the Acqua Vergine: an aqueduct that had been pumping fresh water into Rome since 19 BC. Although Florentine artist Alessandro Galilei won the contest, the commission was awarded to local architect Nicola Salvi, who promptly began construction on the massive Baroque fountain. Influenced by a Bernini design that was never carried out, Salvi's work introduces a series of interpretative elements including massive columns and pilasters, cascading waters into a pool at its base, and a forceful sculpture of Oceanus and his shell-shaped chariot drawn by seahorses and tamed by tritons. An attic with a balustrade and allegoric figures hovers above a triumphal arch, representing abundance, fertility, wealth, and amenity. The Trevi Fountain was finally completed 1762 by another architect, Giovanni Pannini, after Salvi's death in 1751. A 17-month restoration funded by fashion house Fendi was completed in the fall of 2015, bringing the fountain back to its gleaming white splendor. From daytime until past midnight, thousands of tourists crowd around the Trevi's wide basin to catch a glimpse of this fantastical marble creation of mermen, seahorses, and tumbling pools, all presided over by Oceanus, the divine personification of the sea. Here are some things to do while visiting the Trevi Fountain. Toss a Coin in the Fountain. Tourists often visit the Trevi Fountain to take part in a ritual coin toss. 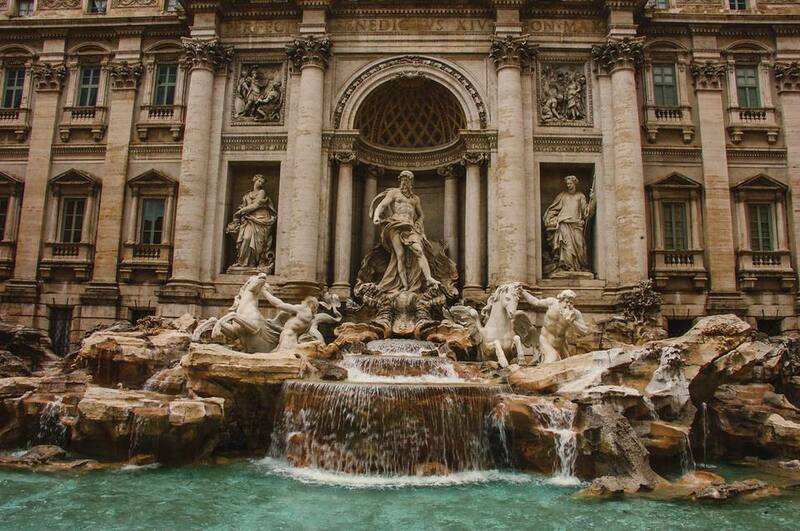 It's said that if you throw a coin into the Trevi Fountain, your return to the Eternal City is assured. A second coin launched promises you'll find love. A third is supposed to guarantee marriage. To do the coin toss correctly (and this apparently matters in order for your luck to hold), face away from the fountain, hold the coin in your right hand and toss it over your left shoulder. Be Amazed by this 18th-Century Baroque masterpiece. Sculpted against the backdrop of the Palazzo Poli, this awe-inspiring travertine fountain stands some 85 feet high and approximately 160 feet wide, spilling almost 2,900,000 cubic feet of water every day. It's estimated that about 3,000 euro of coins are extracted from the fountain each day and donated to charity. It's easy to get distracted by the crowds and photo ops – but do take a few minutes to admire the details and scale of this monumental sculptural fountain. Recall famous movie scenes filmed at the fountain. Cinema has been very good to the Trevi Fountain over the years. Serving as the setting for such classic films as Federico Fellini's La Dolce Vita, Jean Negulesco's Three Coins in a Fountain, William Wyler's Roman Holiday, and even the Julia Roberts hit Eat, Pray, Love, the Fontana di Trevi has become the stuff that Italian dreams are made of. You can't go wading into the fountain like Anita Ekberg's character did in La Dolce Vita (in fact, please don't! ), but it's still fun to relive the iconic cinematic moments filmed here. Of course, the best time to visit Trevi Fountain is when the crowds are at their lightest. This means avoid midday and late afternoons when the area around the fountain is cramped and congested. If you can get there at twilight, you'll find that the evening glow and the dramatic effects of the lighting create a heavenly and romantic atmosphere. Early morning is also a great time to be there, as the piazza is quiet and serene. From Piazza di Spagna: Head southeast to Via di Propaganda and continue on Via di Sant'Andrea delle ​Fratte. Take a left on Largo del Nazareno and a right onto Via della Panetteria. At Via della Stamperia make a right and arrive at Piazza di Trevi. From Termini Train Station: Take the Metro A (red line) to Barberini station and walk 8 minutes to Piazza di Trevi. Do keep in mind that it is strictly forbidden to swim, dangle your feet in the water, eat, or sit on any part of the monument. Violators will be fined anywhere from €450 for swimming, and €240 for sitting, climbing, or picnicking on the fountain. When crowds are at their heaviest (and anytime, really), keep an eye out for pickpockets and petty thieves – the Trevi Fountain is Tourist Central. Spanish Steps. A favorite spot to take a load off, Scalinata di Spagna is a sloping staircase with 138 steps, capped by Trinità dei Monti church. The stairs overlook the playful Fontana della Barcaccia (fountain of the ugly boat) designed by Pietro Bernini, father of Gian Lorenzo Bernini. Piazza Navona. Home to three impressive fountains, most notably Bernini's Fountain of the Four Rivers, this public square is buzzing with people day and night. The Pantheon. Well-preserved and stunning, this former pagan temple, built in the 1st century AD, is now a Christian church. An engineering marvel, it boasts the largest unreinforced cement dome in the world.